interactive map shows schedule for collection service, which will begin on Sept. 9. The Portland Bureau of Transportation will no longer charge a fee for picking up leaves, an annual services that begins again this year on Nov. 9. But, according to Transportation Commissioner Chloe Eudaly, the fee has never come close to covering the cost of the service and has discouraged residents and businesses from participating. "When a policy is not meeting its intended goal, we shouldn't be afraid to reevaluate it and change course if necessary," said Eudaly, who assigned PBOT by Mayor Ted Wheeler in early September. It was previoulsy overseen by Commissioner Dan Saltzman. The service is called Leaf Day, although it actually takes weeks to provide it in the entire city. 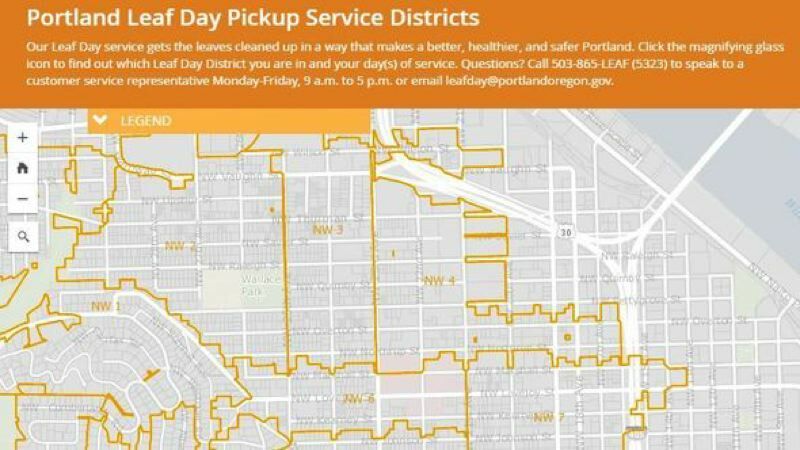 PBOT has released an interactive map of when leaves will be picked up in the 52 collection districts across the city. You can find it at tinyurl.com/ya4mhhps. According to PBOT, the tree canopy covers a significant portion of the city. In autumn, wet fallen leaves can become very slick, creating potential hazards for people walking, biking, rolling or driving through tree-lined neighborhoods. Leaves can also clog storm drains and thus contribute to street flooding during heavy fall rains. To help address these hazards, city crews have been removing thousands of cubic yards of leaves from Portland streets for more than three decades.